The Yellow Cake Road Collective have come back from their first Nuclear Freeways Trip along the proposed nuclear waste transport route from Lucas Heights to Muckaty Station. We have visited various communities with a strong focus on indigenous communities. For the last four years, Traditional Owners of Manuwangku (Muckaty) have been speaking out against federal government plans for a radioactive waste dump on their country, 120 km north of Tennant Creek in the Northern Territory. In late July a group of senior men and women from Muckaty will travel to Sydney and Wollongong to hold public meetings and meet with trade unions and other supporters. 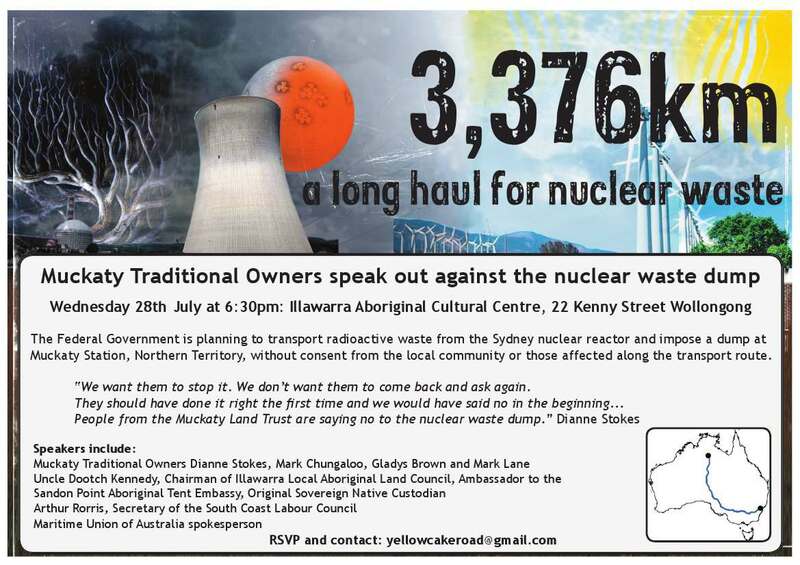 These meetings will also launch the 2010 Nuclear Freeways project, a joint endeavour of Friends of the Earth Sydney and Melbourne. 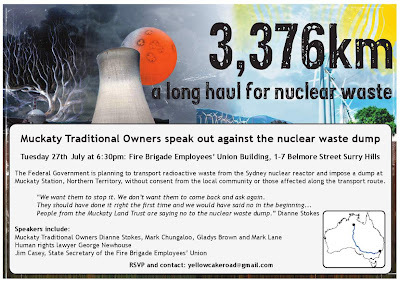 The project is part of the broader campaign to prevent the federal government imposing a nuclear waste dump on unwilling communities in the Northern Territory. 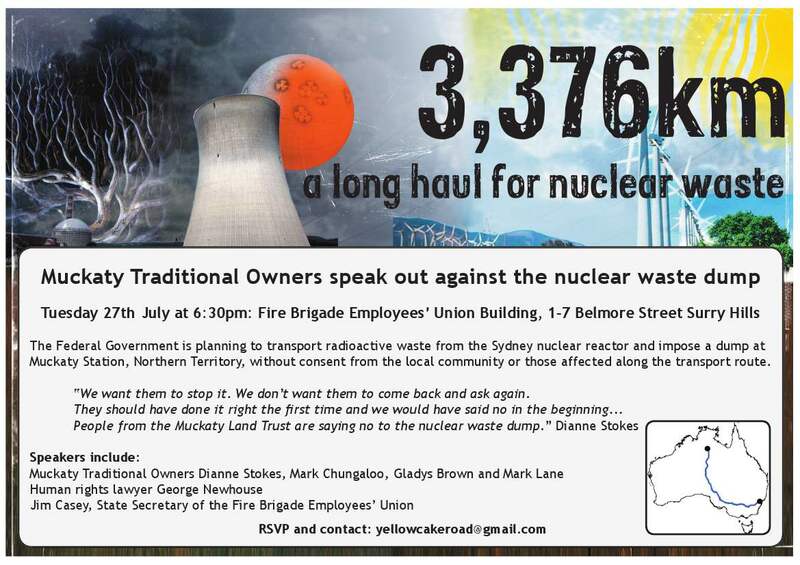 The project is focussed on supporting communities along potential transport routes between the main waste producer – the Lucas Heights nuclear plant in Sydney – and the NT. 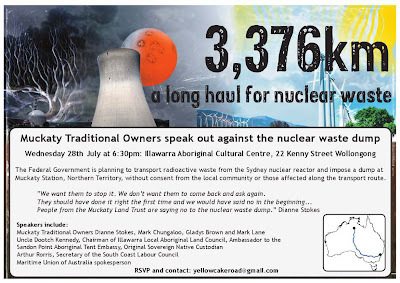 Get active for a nuclear free future! 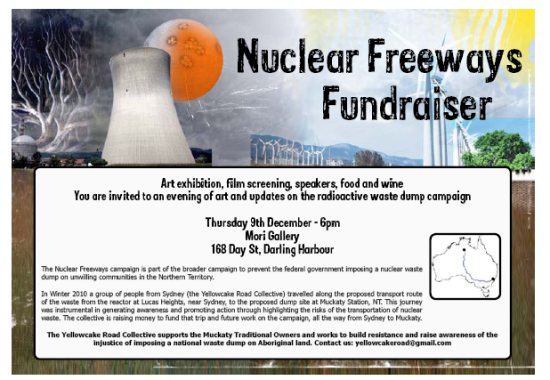 Short film introducing our fabulous nuclear-free campaign! Monday 12th April marked a National Day of Action against the Muckaty Radioactive Waste Dump and for Sydney that meant a message needed to be sent to and heard by Peter Garrett! 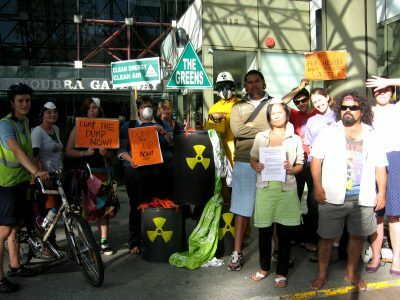 Sydney ASEN crew with Friends of the Earth Sydney created a delicious radioactive waste dump outside of Peter Garrett’s office to show what it felt like to have nasty nuclear waste on his front door. The letter from over 50 Muckaty traditional owners to Martin Ferguson and Peter Garrett were read out aloud to those on the busy Anzac Pde inviting Garrett to listen to their opposition and remove Muckaty as the proposed site. 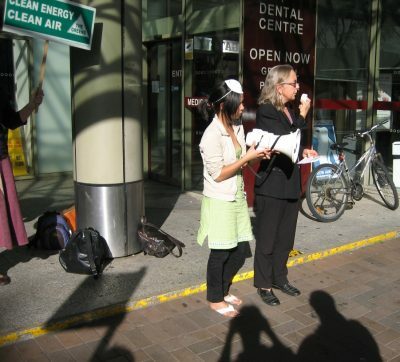 Lee Rhiannon from the Greens spoke of their efforts and solidarity with the Muckaty traditional owners while various others spoke of their concerns with the nomination and consultation process of the nuclear waste dump site. Lastly, letters of support for the Muckaty traditional owner’s opposition were given with some local support gathered in the shopping area. DUMP da DUMP in NT!